HomeMS Honour: A whale of a tale! This year I decided to really push myself with distance swimming, and swimming in the ocean. To test my endurance I signed up for Vancouver Open Water Swim’s Bay Challenge, a 10 kilometre ocean swim across English Bay in Vancouver, Canada. I spent the year training guided by my coaches from Victoria and Tyee Masters. I swam anywhere from 3 to 10 kilometres per day six days a week and cross trained 4 to 8 hours a week. It was a really long year. And then the day finally came, Saturday, July 28, 2012. Boat pick-up was at 5:30 am. Escorted by my partner, the man who would keep me fed and hydrated along the way (Ray Este), my safety person (MJ vanBergen) and my boat’s captain and navigator (Dave Macmahon) we made our way down the dock and jumped into the boat. Ah, who am I kidding, it was 5:30 in the morning and we are all over 45, we can’t jump! 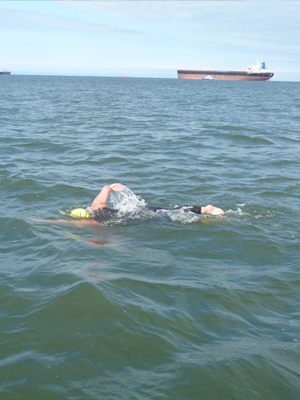 Dave navigated the boat across the bay to West Vancouver, examining the course along the way. By 6:30 am we were on the beach with about 25 other swimmers and their support crews. It was a beautiful sight. There were 16 solos swimmers (10 men and 6 women) and 5 relays (2 or more swimmers in each). I walked around, smiling at each of the swimmers, knowing that we were about to be a part of something very special. I introduced myself to the solo female swimmers and asked if them to gather for a moment to honour one another. The task we were about to undertake was significant, and very few women make the attempt. So to Roberta Cenedese, Jannine Houston, Lorraine Langstaff, Jennifer Leach-Trask and Jylian Russell-Fedora I would like to pay homage to each of you again. I was honoured to swim with you. At about 6:50 Jim Close gave the final safety briefing. We were reminded that we had only 2 hours to make it through the shipping lane. If we did not, we would be plucked from the water and returned to shore. Added to that, there were 3 ships headed our way. Anyone in their path at any point during the swim would have to board their boat, move aside and wait while the ship passed. The pressure was on to move quickly through the shipping lane. The Harbour Master gave us the final go ahead and our boats moved about 10 minutes off shore. We entered the water and a few minutes later the horn went off. Go! The immediate task at hand, find my boat so I could swim beside it escorted me from shore to shore. I soon discovered, this was not an easy thing to do with waves coming at you. Adding fuel to the fire 10 out of the 20 boats looked the same. Luckily, Ray really does love me, and had his eyes on me from the moment I left the shore. My boat made its way to me. I acknowledged my crew, relieved I was found, and looked back to see which boats were behind me. I yelled to my boat “just get me through the shipping lane – I will feed and hydrate once across”. The thought of being pulled out of the water had been seared into my mind. I was not going to let that happen. I had to move quickly! As I swam across the bay I could feel the waves tossing me from side to side. It wasn’t windy and the waves weren’t big, but they were coming at me from all directions. It was like being in a washing machine. I moved as quickly as I could, trying not to swallow sea water. I could feel the tingling in my arms from the cold water as we moved further off shore. I wondered, “What the heck am I doing here.” I thought about stopping for a brief moment. But then I quickly removed that thought from my mind and swam on. When I felt I was far enough along to stop for water I checked with my crew to see if we were out of the shipping lane. They shouted back – another 5-10 minutes – so I pressed on. I stopped again about 10 minutes later for a quick shot of electrolytes. Ray tossed the water to me but missed. When I saw him pulling my water back toward the boat I had a meltdown (sorry buddy, I didn’t mean to yell at you). I had been in the water over an hour and was getting tossed all over the place. I was thirsty and a wee bit cranky. I also wanted to stay ahead of the other boats and knew that every second counted. 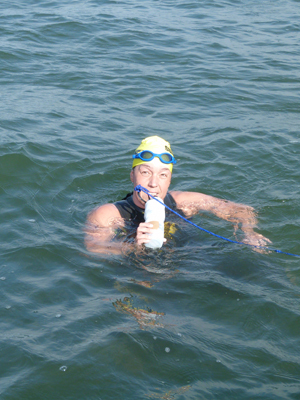 Ray threw the bottle toward me again; I grabbed my drink and electrolytes and swam on. About 10 minutes after my first feeding I started to feel better. It was as though someone had turned the spin cycle down; the water was not as wishy-washy. I began to find my rhythm, breathing on my left side every two strokes. Now I know my coaches who are reading this are saying, “Susan, you should be bilateral breathing”, but on this day, I have to say, I am so glad I was not. Right after I took a breath and put my head back in the water I saw a very very large thing swim by me on my right side from the corner of my eye. It moved slowly and gracefully. My friend and open water mentor (Karen Tannas) had told me that there would be moments during the swim were I might think I was losing my mind. I convinced myself that I was as the thought of swimming beside a whale seemed far worse than insanity at the time. Fully confident I was through the shipping lane I stopped for another electrolyte fix. After my diva moment with the last feeding, Ray wanted to be sure he threw the bottle far enough. This time his aim was dead on, and he hit me right in the head. We had a good laugh, I had a good drink, and I swam on. I stopped a few more times along the way for water and to check in with my crew, always looking back to see the boats behind me. I could see the land getting closer. Now used to my environment and out of the way of the freighters and cruise ships, I played in the waves. About 1.5 to 2k from shore I could see the orange markers. 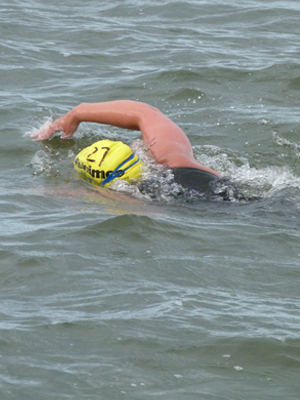 I decided I would dig into my swim and move myself toward the shore as quickly as possible. My stroke felt both relaxed and strong and was able to increase my pace. When I made it to the first set of markers my crew had to leave me. I said “Thanks, I’m ok from here,” and swam toward the beach. The markers kept getting closer. I kept swimming faster. I was so happy. I was going to make it. I could see the bottom now. I swam as far as I could and then pulled myself up and ran out of the water. But wait! That’s not it. I had to run a hundred or more yards up the beach before I was officially finished. UGH. Have you ever swam 10k and then tried to run? If I had not been so high on adrenaline I don’t think I would have made it. While recovering at the first-aid station I heard some of the swimmers talking. They said one of the relay teams had spotted some whales. Perhaps I was not loosing my mind after all. Tyee Masters Swim Club coaches Neil, Mike and Clint and all of the swimmers for making getting up at 5:30 am 3 to 4 times a week enjoyable. The majestic gray whale that shared her water with me that day – it was an honour to swim with you.